OUR PRICE: $31.34 - Join Rewards Get $3 Dance Dollars On This Item! Bloch's "Phantom" stretch canvas jazz shoe reflects the contours of the foot for greater arch definition and features a revolutionary combination of rubber and suede in the split sole design. 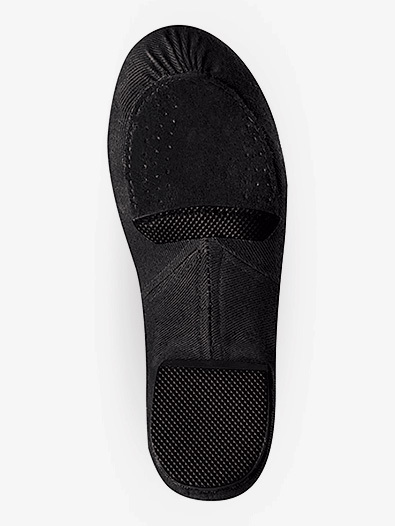 The moldable suede front sole allows the dancer to feel the floor and facilitates spinning when in releve and the rubber brake pad provides a controlled grip when the foot is flat. Excellent for competitions! My daughter had these shoes for just a few months and got a hole in the toe. Her sister is on the non canvas material's hand me downs of the blochs. These definitely don't last very long. This pair of shoes is great and comfy. Also, makes my feet look good ! Please be aware that this shoe runs VERY SMALL. My daughter wears a size 8 in women's and I ordered her a 7.5 and it was way too small. She ended up wearing my other daughter's 9.5. They tell you to order half a size smaller than street size. I am a street size 6, so for me that would be a 5.5....I didn't think that sounded right. So I ordered a 6.5, it is SO tight! School starts for me in a week and I don't know if I have enough time to get the right size. The shoe itself seems great, but I won't know until I get a size that fits and dance in them to see how long they last. Pretty disappointed in the size chart on this one. If you prefer tight fitting jazz shoes then you must get these! They suction to your feet and it feels like you are wearing a sock! The only problem I have with them is the heel. When you slide into the splits without hands the heel pushes out from under you and the back practically slips off. Otherwise these are my favorite jazz shoes and I prefer them over Bloch leather jazz shoes. The canvas shoes are really comfortable. This fits snug and looks great on the foot. They do stretch out eventually and wear faster than a leather shoe obviously but is worth it for the gorgeous line! I found that these shoes run small. My shoe size is a US 7.5 and the size 8.0 fits me well. The shoes are comfortable and have a flattering fit on the foot, especially on the arch. The main drawback is that they do not last. The canvas started to wear out fairly quickly, I had holes form in the toes of the shoes. These shoes make the most of the dancer's arch and are great for turning. Like any canvas shoe, these have a shorter lifespan than a leather shoe will. The tan stays looking better longer in class and competition wear. The black seems to pick up dust and "gray out" a bit. Our highest level competitive dancers were able to get through the season in two pairs. They really do make the feet look great on stage! The stretch canvas is very comfortable and really help you use the floor and work through your feet. I wear a 7/12 or 8 street shoe and wear a 71/2 in this jazz shoe. It fits very snugly, but that's just the way I like it. They do stretch a bit so you don't want ANY excess fabric. Hey Bloch... this same shoe design, but in leather with that stretch canvas as an inset for the arches??? Please!! I LOVE these shoes!! They feel like socks, soft and comfortable. I generally wear a size 9 1/2 and i ordered a 8 1/2, it is perfect! These really show off my arches. No more baggy toes around my jazz shoes! They will not last nearly as long as leather styles, but are very comfortable and well made. When the shoes came in they looked absolutely beautiful! Out of 23 girls and 1 guy, we only had one pair that was a little snug. They look like you aren't wearing shoes. We used them on a football field and they didn't last long at all. That being said, they also aren't made for outdoor wear. Oh well, would totally wear these for indoor classes. My daughter loves these shoes but they don't last long. We are already on our 3rd pair of shoes already. They look great on stage!! They look like they have nothing on their feet!! Judges like them too!! Canvas is pretty thin and not very flattering to the foot. Overall, I like the shoe, it's comfortable and I like that the bottom isn't rubber so it's easy to turn. Overall, I don't regret the purchase but don't plan on purchasing this shoe again next year. Yes, just yes. They make your feet look gorgeous and amazing! Also extremely easy to turn in. Yes, they do run pretty small. I wear a street shoe size 8 and the 9 1/2 fits perfectly. I absolutely love these jazz shoes. They are great for class an also they are super easy to turn in. Unlike leather jazz shoes, these shoes really form to your feet and also the soles are nor plastic. These are great and I recommend these to everyone. This shoe is amazing! It is very comfortable and makes your arch look amazing. 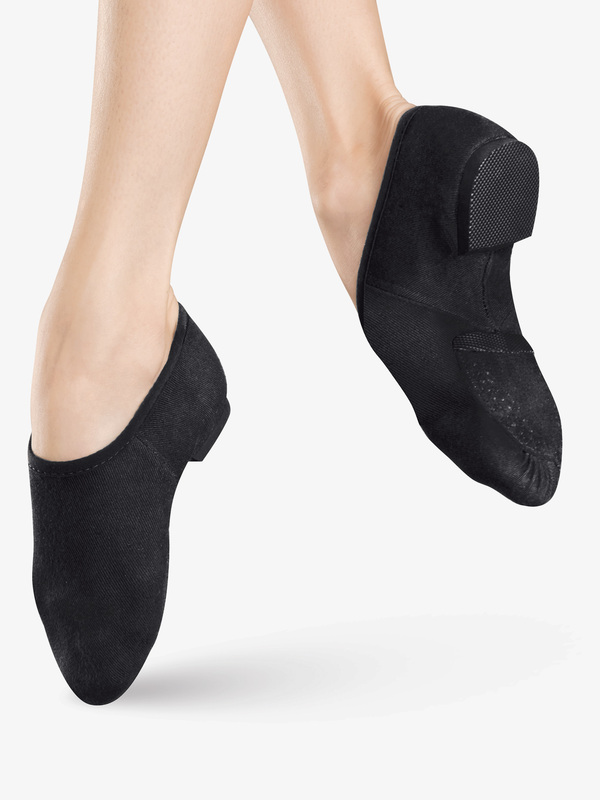 And yes the shoe does run small, In the past I have had the bloch elasta bootie and I have been a 9 in them and in these I am a 10 and it fits like a glove. How does the sizing on the Phantom compare to that of the Bloch Neoflex? The phantom is a full canvas shoe made to look invisable on the foot. The Neoflex is also a sleek look however is a leather shoe with a neoprene arch to allow for best flexibility. Both are comfortable, however gives a slightly different look, depending on what you are looking for. 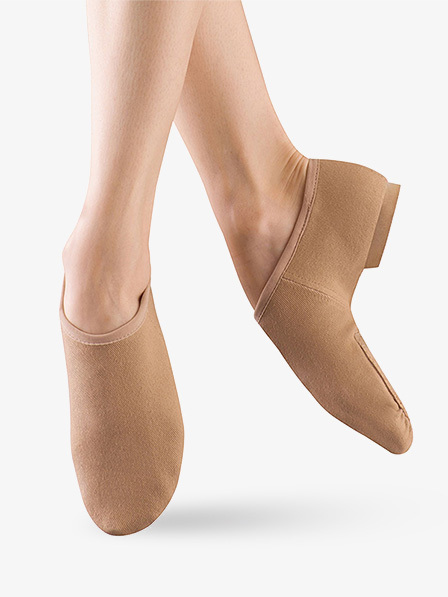 What color bloch tights match the tan phantom shoe? The Bloch Light Tan would match the S0473L in tan the best.